BGORUG is the rail users' group for the service between Barking and Gospel Oak. 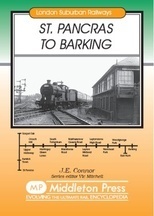 We have been in existence for over 50 years, originally known as the Barking & Kentish Town Line Committee, firstly to fight the line's closure, as proposed in the infamous Beeching Report, and then changing our name to the Barking & Gospel Oak Line Committee in 1981 when the service was withdrawn from Kentish Town and rerouted to Gospel Oak to link up with the North London Line, another line that was proposed for closure by Beeching. Once the threat of closure was removed, the group set about getting improvements to the run-down stations and train service along the Forgotten Railway, as passengers and staff called it, although it emerged in the early 1990s that British Rail were still considering closing the South Tottenham - Woodgrange Park section to avoid the cost of maintaining the many near life expired steel bridges in that section of line. Introducing Oyster Pay-As-You-Go (thereby reducing some fares) has brought about a massive increase in the numbers of passengers using the line, and it has become a victim of its own success. So the Barking - Gospel Oak Line User Group, as we were by then, found itself with a new fight on its hands, that of getting TfL to continually upgrade the service to cope with the amazing numbers of passengers that now flock to use it. Persuading TfL to increase late-evening services from 2 trains per hour to 3 from mid-January 2018. Getting earlier first trains and later last trains and extending improved off-peak train frequencies and an all-year round Sunday service (it used to be summer only!) 1992 - 2007. TfL again funded some of these improvements. Achieving the goal of a 20-year campaign to link Walthamstow Queen's Road and Walthamstow Central stations with a footpath. The culmination of a 6-year campaign to electrify the last diesel only railway in NE London with the announcement of Government funding in 2013. This was reflected in the winning of the prestigious national Railfuture Rail User Group Award for Best Campaign in November 2013. Secretary Glenn Wallis also received a personal award from Waltham Forest Council. BGORUG has demonstrated that it is an effective, campaigning organisation with the needs of the passengers of the line at its heart. Achieving this level of success does not come without cost. Apart from occasional grants from local councils, we rely on our members subscriptions to fund our work. Please join us! Annual membership is only £5.00 and members receive regular news with three meetings per year with representatives of the operating company, TfL, London Travelwatch and British Transport Police attending to report and listen directly to members' concerns. Membership Applications: You can download a membership application from here. Print off the form and complete the required details and post with your cheque to the Treasurer. Alternatively you can pay electronically, but we ask that you either post the completed form or email the required details to the Treasurer. If you have any photos, comments or suggestions on how to improve this site please e-mail info@barking-gospeloak.org.uk.